An exciting opportunity for members of the MSBA! participate in the Bee Informed Partnership’s Sentinel Apiary Program (BIP-SAP). 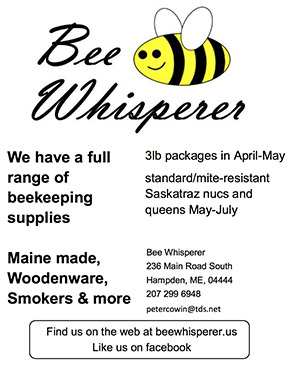 Three (3) beekeepers or chapter clubs from around Maine will be chosen to participate in the MSBA BIP-SAP program for 2018. Data collected will be published real-time on the MSBA website and bimonthly in The Bee Line allowing beekeepers around the state to make informed management decisions. The BIP Sentinel Apiary Program uses hive scales and monthly disease assessments to monitor honey bee health. Sentinel Apiary data is available real-time making the Sentinel Apiaries an early warning system, alerting beekeepers of potential problems (Varroa, Nosema spp., changes in nectar flows, etc.). What does hosting a Sentinel Apiary involve? Having at least four (4) hives in one location. Collecting six (6) monthly samples (May – October) from hives and mailing them to BIP in Maryland. Receiving reports on submitted samples of Varroa and Nosema spp. spore counts. Sharing data with the MSBA. How does the MSBA help? The MSBA is offering $400 grants to three (3) individuals or chapter clubs to offset the costs involved with participating in BIP-SAP. An initial $200 will be awarded at the time of selection and the remaining $200 after final sampling results have been returned. What about the BIP fee for participation? BIP charges a participation fee of $275 (4 hives) or $500 (8 hives). The MSBA will cover the 2018 participation fee for the three (3) selected beekeepers or chapter clubs at the 4-colony level ($275 per participant). Payment will be made by the MSBA in March directly to BIP on behalf of the participants. If you choose to participate at the 8-colony level, the individual or chapter club is responsible for the remaining expense. What are other out-of- pocket expenses for participation? Expenses include initial purchase of the hive scale &amp; monitoring, batteries, and sample shipping costs (estimated cost range of $10-$12 per sample). The $400 MSBA subsidy helps! What happens to the hive scale? The participant or chapter club keeps the hive scale at the end of the project. Yes. Grant applicants must be current members of the MSBA, should have at least two bee seasons of experience, are capable of collecting samples and willing to share data. Interested beekeepers must submit an application plus a recommendation from a MSBA member club president, a Master Beekeeper, or the State Apiarist. Deadline for application is midnight, February 23, 2018. Applications may be submitted online or by downloading and filling out the MSBA BIP-SAP application form. The mailing address for application submission is on the form.